The theme of the March 24-25 weekend session for the Lazaridis EMTM program was “Creative Disruption”. Lazaridis School alumni Jennifer Smith (MSc ’12), Shawn Mills (MBA ’15) and Curtis Lingard (MBA ’15) – who all work in senior positions at Christie Digital Systems – joined EMTM learners. 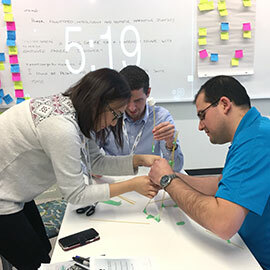 Lazaridis EMTM learners and the senior-level Christie staff were guided through the process of design thinking during the workshops, led by renowned Stanford instructor at the Hasso Plattner Institute of Design, better known as d.school, and GE Healthcare innovation architect Doug Dietz. Dietz has been a designer at GE for almost 30 years, designing diagnostic imaging equipment such as CT scanners and MRI machines. His award-winning "Adventure Series" represents a revolutionary re-imagination of healthcare delivery for children, a story captured in Dietz's 2012 TEDx talk. The workshop was a wonderful opportunity to bring together our the current cohort of learners with senior-level alumni; they left the session with a whole new toolkit for creative disruption. At the end of the session, the cohort formulated a well-defined customer’s point of view, generated ideas for exciting new forms and modes of entertainment delivery, and prototyped solutions. The exercise resulted in three innovative, exciting and relevant possible design solutions.